Leader of the Islamic Revolution Ayatollah Seyyed Ali Khamenei says Iran is not worried by the results of the US presidential election, but it is equally prepared to face any eventuality. “Unlike some of those in the world who have either been mourning or celebrating the results of the American elections, we are neither mourning nor celebrating and the results make no difference to us,” he said in Tehran on Wednesday. 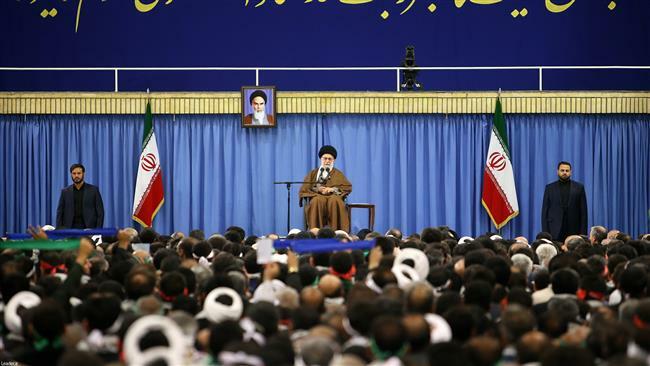 “We have no worries and by the grace of God, we are ready to face any possible eventuality,” the Leader told a group of visitors from the central Iranian city of Isfahan. Ayatollah Khamenei said both parties in the US elections follow the hostile policy which Washington has adopted against the Islamic Republic since 1979. Ayatollah Khamenei said the elections, which marked an unflattering portrayal of the US situation including poverty and many other problems by President-elect Donald Trump, revealed the realities of the American society. “The person who was elected as the US president said during the election campaign that the American money spent on wars in the past few years could have rebuilt America twice if it had been used inside the county,” the Leader said. “America in recent years has spent its tax money on despicable wars which have resulted in the massacre of tens of thousands of civilians and destruction of infrastructure in Afghanistan, Iraq, Libya, Syria and Yemen,” Ayatollah Khamenei added.